Thank you for helping us welcome our first child. We couldn't be more excited and nervous. We appreciate all of your insight and generosity as we embark on this journey as parents. While we wait to meet this little one, the baby has lovingly been referred to as Pizza Bagel to reflect our backgrounds. Boy or girl, this nickname may stick for a while. Thank you again. We can't wait to introduce you to this little human soon. As we watch the news, a baby registry seems silly and almost cruel when families are torn apart with no legal pathway to reunite them. Infants as young as eight months are without mothers. Guards prohibited from changing diapers. Concrete floors and cages in for-profit infant and child detention centers. As a mother-to-be and as an American, I am sick to my stomach over this. 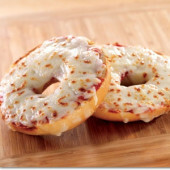 Pizza Bagel will be loved and want for nothing regardless of a shower. In lieu of gifts, please consider donating to RAICES, the largest immigration nonprofit in Texas. This organization offers free and low-cost legal services to immigrant children and families. It will be doing the hard work of reuniting families for the months and maybe years to come.